Over 1,700 pizza lovers cast votes during last month’s Great Westport Pizza Contest. Sponsored by the Westport Weston Chamber of Commerce, 14 restaurants competed in 7 categories. Honorable mention: Romanacci Pizza Bar and Planet Pizza lost by only 2 votes in the “Best personal pizza” and “Best delivered pizza” categories, respectively. 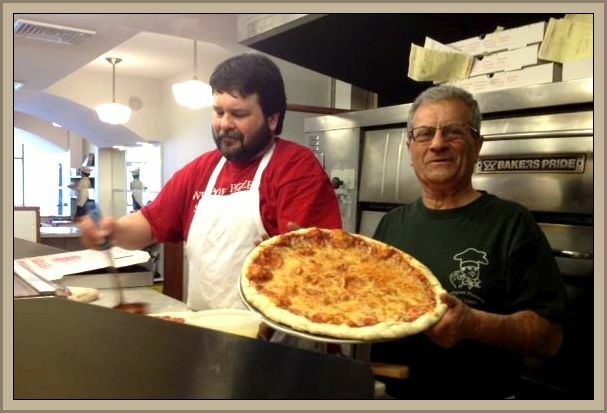 Mel Mioli’s Westport Pizzeria may have moved to the Post Road, after 45 years on Main Street. But it’s still a Westport favorite. The victors did not get any dough — just the satisfaction of coming out on top (and free publicity). Any way you slice it, the Great Westport Pizza Contest was a winner. March was Westport Pizza Month. That’s not just an idea — it was an official proclamation from 1st Selectman Jim Marpe (2nd from left). 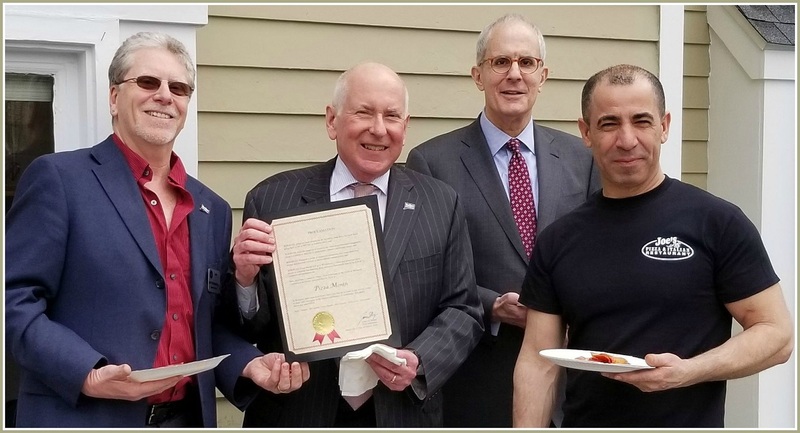 Joining him were (from left) Westport Chamber of Commerce director Matthew Mandell; Ira Bloom of event sponsors Bercham Moses, and Joe Canicatti, owner of double winner Joe’s Pizza. This entry was posted in Organizations, Restaurants and tagged Joe's Pizza, Jordan's Restaurant, Planet Pizza, Rizzuto's restaurant, Romanacci Pizza, Tutti's Ristorante, Westport Pizzeria, Westport-Weston Chamber of Commerce. Bookmark the permalink. Hurray for Mel Mioli! For 45 years he has known my name when I come in and if I order a pizza for delivery they know my address before I finish saying it. After the loss of Welch’s Hardware, the Food Center, Greenberg’s, the Mobile Gas Station, the Remarkable Bookshop and countless other small retail shops, Westport Pizza remains one of the few classics! Survey results align with my own opinions on the matter, although I like my Westport Pizzeria pizza just the same whether it’s delivered or I eat it in their friendly downtown Westport location. But there is definitely room for different pizza tastes in Town – congrats to all of the winners and honorable mentions! Fun and great to see the results! Great to see Westport Pizza is still around and still the winner. At least one good thing hasn’t changed in Wspt. What about Angelina’s? Our favorite.